Out of the Blue explores interesting twists in Lynch’s journey as an artist that led to this point in her career. 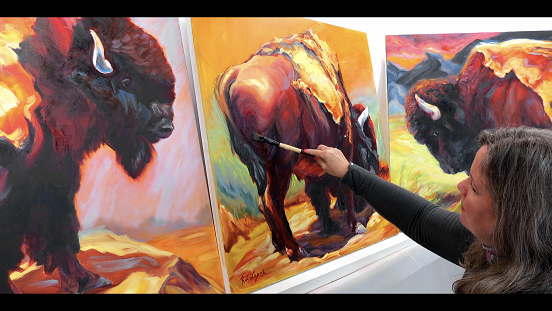 While her work often carries similar traits – bold color, sinuous movement, power of form, value contrast, and graceful yet energetic lines – she enjoys exploring the different processes of abstract, figurative, wildlife, studio landscape and plein air landscape. This exhibition will highlight the landscape, figurative, abstract and wildlife parts of Lynch’s oeuvre, and what spurred her to begin each. An opening reception for Out of the Blue-Animals and Abstracts will be held on Saturday, March 16, 2019, 2-4 pm. The exhibition will be on view through April 28, 2019.